Most of the weight we gain in a year is gained over the holidays. One feast isn’t a problem; it’s the accumulation of feasts and treats that pack on the pounds. This article reviews two methods of minimizing the fat gained from binging: dietary awareness and food choice. For many, the holiday season is a time for indulgence, with Thanksgiving, Christmas, and New Year occurring in quick succession. 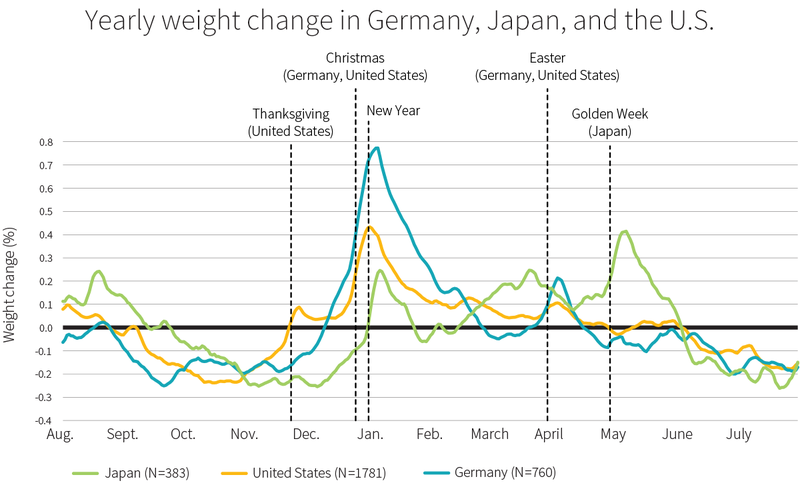 In fact, most of the weight gained in a year is gained over the holidays, and this added weight appears to be mostly fat. So, holiday feasts and treats may play a key role in the slow, insidious fat gain most of us experience as we age. If people shed their holiday fat over the course of the following year, all would be well, but most fail to do so. Their New Year’s resolutions soon forgotten, they resume their (over)eating habits. Just like Thanksgiving marks the start of the shopping season leading to Christmas, it also marks the start of the feasting season. 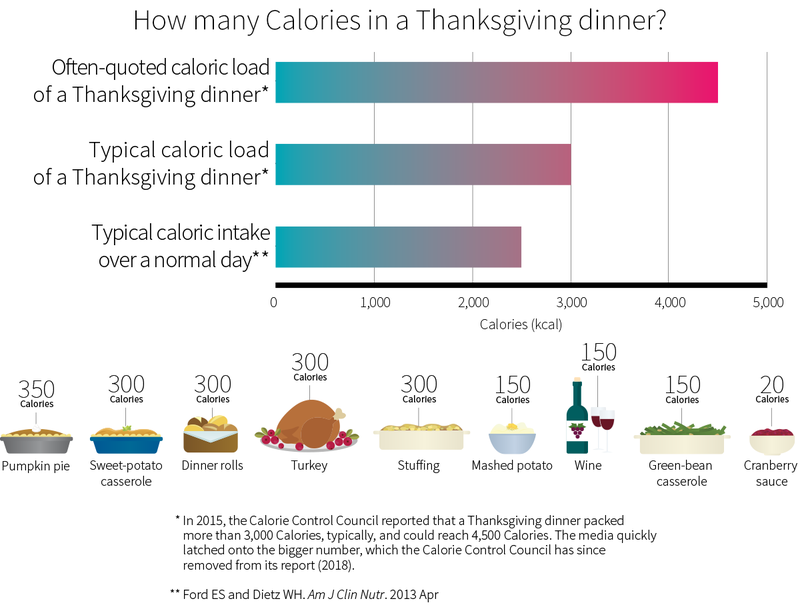 In 2015, the Calorie Control Council reported that a Thanksgiving dinner packed more than 3,000 Calories, typically, and could reach 4,500 Calories. The media quickly latched onto the bigger number, which the Calorie Control Council has since removed from its report (2018). Even “just” 3,000 Calories, however, is 500 Calories more than the typical daily caloric intake adjusted for underreporting. Now, one feast isn’t going to make you gain ten pounds of fat — there’s a limit to the amount of food your body can process for storage over a given amount of time. What your body cannot process for storage during that time, it tries to burn (your temperature rises slightly) and excrete (you end fighting with your family for access to the toilets). One feast, therefore, isn’t a big problem. The problem is the quick succession of feasts — including feasting on leftover goodies during the following days. People do compensate for binges by eating less for some time afterward, but not less enough or for long enough to make up for the caloric surplus generated during the binge. Moreover, eating big late in the day makes it hard for your body to regulate your daily caloric intake: if you eat a big breakfast, you’ll probably eat less the rest of the day, but if you eat a big dinner, you aren’t likely to eat a lot less the next day. Whereas the occasional feast might not cause too much fat gain, the many feasts and treats that pepper the holiday season do add up. This helps explain the steady weight gain people experience as they age. We’ll now review two methods of minimizing fat gain: dietary awareness and food choice (the kind of foods to favor and the kind of foods to avoid). Tracking what you eat and drink, or simply being more mindful of your food choices, is one way to minimize fat gain. Studies suggest that self-monitoring can prevent weight gain, and even promote weight loss. Among members of the National Weight Control Registry, who have all maintained at least 30 pounds of weight loss for more than a year, holiday weight gain correlates with relaxed attention toward body weight and eating behaviors. Among people enrolled in the Diabetes Prevention Program, only the consistent diet trackers (more than 67% of days tracked) lost weight through the holiday season; the other participants gained weight. Over the year of a cognitive-behavioral weight-loss program, all men and women lost weight, but only the most consistent self-monitors did so even during the holidays, when most of the participants gained weight. As a follow-up intervention, calling and mailing people during the holidays to remind them to self-monitor increased self-monitoring and weight loss, both of which were again found to be correlated. But let’s be frank: few people want to track their food intake, especially during the holidays, when hyper-palatable, calorie-dense dishes of deliciousness are plentiful and grandma will be so hurt if you refuse this second… third… okay, fourth slice of pie. Being aware of what you eat, and tracking what you ate, can help you lose fat over the course of a year. If you’re really diligent, it can even help you lose fat during the holiday season! If you balk at the idea of tracking what you eat and drink during a feast, another way to minimize fat gain is to favor foods rich in protein, fiber, and water (over, say, Aunt Mary’s brown-sugar-glazed sweet potatoes with marshmallows). Fat provides 9 Calories per gram, and its DIT is 0–3%. Carbohydrate provides 4 Calories per gram, and its DIT is 5–10%. Protein provides 4 Calories per gram, and its DIT is 20–30%. Some of the calories in the food you ingest will be used to digest, absorb, and metabolize the rest of the food, and some will end burned off as heat. The overall process is known indifferently as dietary induced thermogenesis (DIT), thermic effect of food (TEF), or specific dynamic action (SDA). DIT represents about 10% of the caloric intake of healthy adults eating a standard mixed diet, but your actual number will depend on various factors, such as your lean body mass and the size and composition of your meal. You may find it harder to binge on protein-rich foods, though, for protein is especially satiating when it makes for 25–81% of a meal’s calories. One possible reason, especially for women, is protein’s higher DIT. 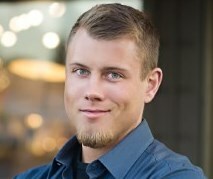 Another reason is that amino acids, especially leucine, directly tell your brain you’re being fed, both by suppressing the “starvation-sensing” AMPK in your hypothalamus, your brain’s master appetite regulator, and by stimulating the mTOR signaling pathway, which is involved in protein synthesis, cell growth, and reproduction. Protein has another advantage: it promotes fat loss over muscle loss. In another article, we’ve seen that if you’re overweight or obese, you should aim for 1.2–1.5 grams of daily protein per kilogram of body weight (0.54–0.68 g/lb). And if you’re of healthy weight but still wish to lose fat while conserving muscle, you should aim for 2.2–3.3 grams of daily protein per kilogram of body weight (1.00–1.50 g/lb). Satiety is also where fiber and water come into play. Foods full of fiber and water, having low caloric density, promote appetite regulation. Simply eating a salad at the start of a meal can reduce your caloric intake for the whole meal. There is actually a diet based on the satiating properties of high-fiber, high-water foods, called the Volumetrics diet. A study had obese women eat more water-rich food (e.g., fruit, vegetables, and soups) at the expense of fat-rich food. This Volumetrics group experienced less hunger and greater weight loss than the control group, who’d only been instructed to eat less fat-rich food. A more recent trial of overweight and obese women evaluated Slimming World, a commercial diet program, with similar findings: compared to the women told to reduce their caloric intake, the women told to eat low-energy-density foods at will consumed fewer calories at dinner and from snacks, experienced less hunger, and lost more weight. Calorie for calorie, foods rich in fiber and water take more space in the stomach and delay its emptying, which partly explains their satiating effect. The magnitude of this effect varies between individuals, for reasons that are still being investigated. Foods higher in protein burn more calories (and spare muscle during weight loss). Foods higher in protein, fiber, and water increase satiety. Focusing on such foods (vegetables, lean meats …) will reduce your caloric intake during a binge. Now that you know which foods to favor to minimize fat gain, let’s consider which foods you might want to avoid. First comes fat. Dietary fat is the macronutrient that can most easily increase your body fat: the two types of fat are essentially the same, so making the former into the latter is easy for your body. Dietary fat gets stored with 90–95% efficiency, compared to 75–85% efficiency for carbohydrate. When you eat carbs, your body can, in order of priority, burn them for energy, store them as glycogen, burn them off as heat, or, as its very last choice, turn them into fat. So if you overeat with carbs as your main source of calories, the excess might not translate as fat gain. When you eat protein, your body can, in order of priority, use it for protein synthesis and many other metabolic purposes, burn it for energy, or, rarely, turn it into glucose or fat. So, again, if you overeat with protein as your main source of calories, the excess might not translate as fat gain (especially since, as we saw, protein has a high DIT). When you eat fat, however, your body has only two options: burn it for energy, if neither carbohydrate nor excess protein is available, or store it as fat (body fat is mostly stored energy; only a few grams of the stored essential fatty acids are needed daily for metabolic purposes). The unburned fat can only be stored, so if you overeat with fat as your main source of calories, even for just one day, the excess translates as fat gain. Since your body will burn carbs and even excess protein before it burns fat, how much fat you eat won’t substantially affect how much carbs or protein you burn, but how much fat you burn will depend on how much carbs (and, to a lesser extent, protein) you eat. To put it another way, how much carbs and protein you eat will affect your total caloric intake, and if you consume more calories than you burn, then all the excess dietary fat gets stored. Another problem with fat is its caloric density: 9 Calories per gram, versus 4 for protein and carbs. Just as their low caloric density makes high-fiber, high-water foods satiating, fat’s high caloric density makes it less satiating. Alcohol’s caloric density (7 Calories per gram) is second only to fat’s, yet alcohol and fat are problematic for opposite reasons: when your body needs fuel, fat is its last choice; alcohol, its first. Therefore, the more alcohol you drink, the less carbohydrate, excess protein, and fat your body will burn, and so the more it’ll store. And to make fat gain even more likely, alcohol increases appetite and food intake to an even greater extent than do Netflix marathons or sleep restriction. Dietary fat is more calorie-dense and, as a rule, less satiating than protein or carbs. Your body finds it easy to digest and store as body fat. Your body prioritizes burning alcohol. As a result, you store more of the fat, protein, and carbs you consume. Alcohol also stimulates appetite, making you eat more. When all is said and done, the best thing you can do after a binge is drink six to twelve glasses of lemon water with maple syrup and cayenne pepper. The best thing you can do is, first, to avoid stressing out. Either go back to your normal eating habits or create an energy deficit the next day or two: eating 25% less than your maintenance caloric intake won’t much affect the hormones involved in regulating your appetite: you won’t get much hungrier, so you won’t likely start a hellish cycle of feasts and famines (also known as “yo-yo dieting”). Starving yourself after Thanksgiving isn’t necessary, yet alternating periods of eating more and eating less could help you regain or maintain a healthy weight. Various types of intermittent fasting have been shown to help with losing weight safely, and they let you incorporate big satisfying meals into your routine. Occasional overeating isn’t inherently unhealthy. To help mitigate weight gain, eat more of the veggies and lean meats to blunt your appetite before the desserts. Being aware of what you eat, favoring the foods rich in protein, fiber, and water, and minimizing alcohol and the foods rich in fat can help minimize fat gain when feasting. If you wish to lose fat, dieting comes first, exercise second. No supplement will replace either, but some supplements can make both more efficient. To learn which supplements are backed by the evidence and how to take them (when, how much, and in what combinations), read our constantly updated Fat Loss guide.